What is an intra-procedural data-flow analysis anyway? The Wikipedia page describes it quite alright: an intra-procedural data-flow analysis operates on a control-flow graph – called UnitGraph in Soot – for a single method. A unit graph contains statements as nodes, and there is an edge between two nodes if control can flow from the statement represented by the source node to the statement represented by the target node. A data-flow analysis associates two elements with each node in the unit graph, usually two so-called flow sets: one in-set and one out-set. These sets are (1) initialized, then (2) propagated through the unit graph along statement nodes until (3) a fixed point is reached. In the end, all you do is inspect the flow set before and after each statement. By the design of the analysis, your flow sets should tell you exactly the information you need. ForwardBranchedFlowAnalysis – this is essentially a forward analysis but it allows you to propagate different flow sets into different branches. For instance, if you process a statement like if(p!=null) then you may propagate the into “p is not null” into the “then” branch and “p is null” into the ”else” branch. What direction you want to use depends entirely on your analysis problem. In the following we assume that we want to do a forward analysis. To implement a forward flow analysis, we subclass ForwardFlowAnalysis. A good example of what this could look like is GuaranteedDefsAnalysis. N: The node type. Usually this will be Unit but in general you are also allowed to have flow analyses over graphs that hold other kind of nodes. A: The abstraction type. Oftentimes people use sets or maps as their abstraction but in general you can use anything you like. Beware though, that your abstraction type must implement equals(..) and hashCode() correctly, so that Soot can determine when a fixed point has been reached! You have to implement a constructor that at least takes a DirectedGraph<N> as an an argument (where N is your node type; see above) and passes this on to the super constructor. 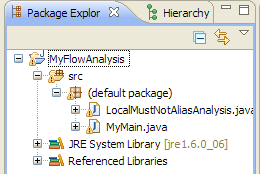 Also, you should call doAnalysis() at the end of your constructor, which will actually execute the flow analysis. Between the super constructor call and the call to doAnalysis() you can set up your own analysis data structures. The copy(..) method takes two arguments of type A (your abstraction), a source and a target. It merely copies the source into the target. Note that the class A has to provide appropriate methods. In particular, A may not be immutable. You can work around this limitation by using a box or set type for A. The merge(..) method is used to merge flow sets at merge points of the control-flow, e.g. at the end of a branching statement (if/then/else). Opposed to copy(..) it takes three arguments, an out-set from the left-hand branch, an out-set from the right-hand branch and another set, which is going to be the newly merged in-set for the next statement after the merge point. An in-set of type A. The node that is to be processed. This is of type N, i.e. usually a Unit. An out-set of type A. The content of this method again depends entirely on your analysis and abstraction. That’s it really. Again, a good example is GuaranteedDefsAnalysis. 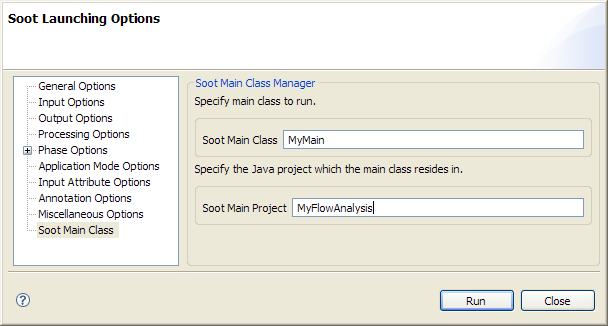 To see all flow-analysis implementations in Soot, browse all sub-classes of FlowAnalysis. 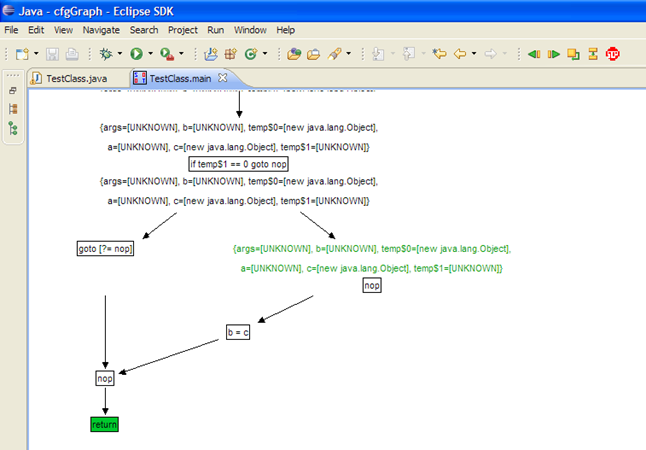 It is very easy to debug your flow analysis using the Soot Eclipse plugin. First install the plugin. 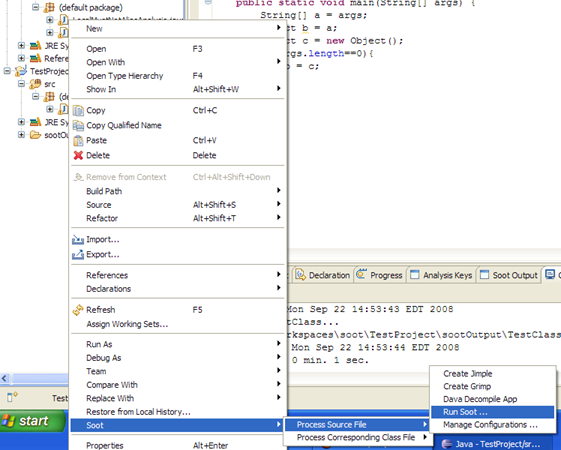 Select A simple BodyTransformer and assign a project name, e.g. MyFlowAnalysis. Implement your subclass of ForwardFlowAnalysis (or Backward… or Branched..) as stated above. Assume that we call it LocalMustNotAliasAnalysis in our case. You project structure should now look like shown on the right-hand side. This hooks up the analysis into the Jimple Transformation Pack of Soot. 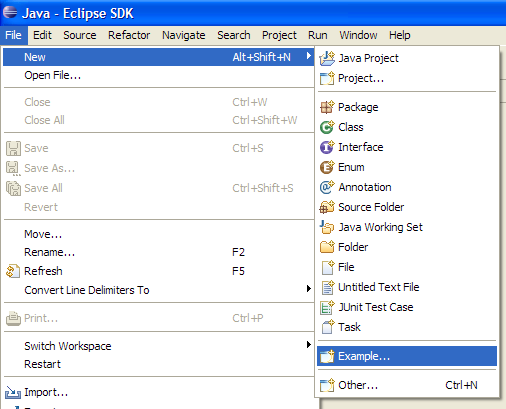 Next we would like to launch your analysis within Eclipse. To do so, we need a test project which we can apply the analysis to. Create a test project with a simple class that you wish to analyze. 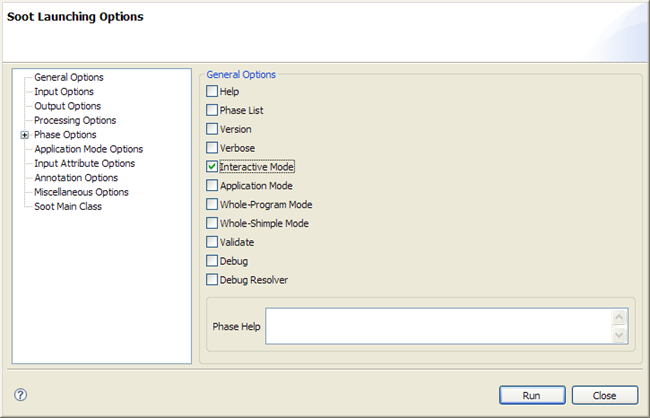 In the General Options select the Interactive Mode. On the tab Soot Main Class enter the name of your driver class, e.g. MyMain, and the Eclipse project that contains this class, e.g. MyFlowAnalysis. Then, select Run. Soot will display the unit graph for the method that your are analyzing. You can step through the graph as usual. Along with each node, the plugin shows you the in-set and out-set. Soot determines the text that appears here by calling toString() on your abstraction object (type variable A). You can display the result of your analysis as tags. To do so, simply add a Tag to any Host. After Eclipse has executed your analysis, it will display the results stored in the tag when you hover over the tagged element with your mouse.